Société®Roquefort Renowned for its well balanced flavour and distinctive aroma, Société®Roquefort is a PDO protected, soft blue sheep's milk cheese from the Southern France. Deep in the famous caves of Roquefort-sur-Soulzon, on the screen of Combalou mountain, every wheel of Société®Roquefort is typically aged for at least 90 days in temperature-controlled caves and cellars. This helps to develop the characteristic emerald veining from the Penicillium Roquefort that makes Société®Roquefort so distinctive. 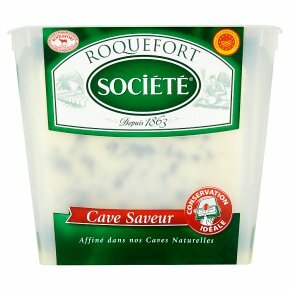 With its complex 'blue' flavour and creamy texture, Société®Roquefort perfect addition to any cheeseboard. Made with unpasteurised sheep's milk. Not suitable for vegetarians.